After making one uber-successful dish from my Nigella Lawson’s Feast cookbook , I thought I’d try my hand at something else. Involtini means something wrapped around something else and this recipe wraps eggplant around a flavourful cheese stuffing. Years ago, I had made another Nigella involtini dish with a group of friends, mixing it up with goat cheese, chorizo and pistachios, and oh my, it was good! So when I had a small dinner party coming up, I decided to try my hand at eggplants once again and try the recipe from Feast . I should point out that I don’t really like eggplant. I never buy it and I steer clear from eggplant dips at parties. It just ain’t my thing. About 15 years ago when I was a vegetarian, I thought I’d try my hand at making a roasted eggplant dish. I ended up throwing it into the garbage. But when we were in Europe this past September, we couch-surfed with a lot of eggplant eaters and hence, we ate a lot of eggplant too. And you know what, it wasn’t awful. So that got me to thinking of that old involtini I had co-baked with a kitchen full of friends many years ago. I decided that I’d try it one more time. Luckily, the recipe turned out fabulously! Even Cornelius who hates eggplant more than me, loved it too. I really think that this dish can turn eggplant haters into dreamy eggplant lovers. It’s just that good. This recipe isn’t as labour intensive as you might think. The key to my success was taking Nigella’s tip and preparing the eggplant the night before the party. I also decided to make a homemade tomato sauce and made that too before heading to bed. If you want to go an easier route, as Nigella does, use a good bottled tomato sauce instead. 1. 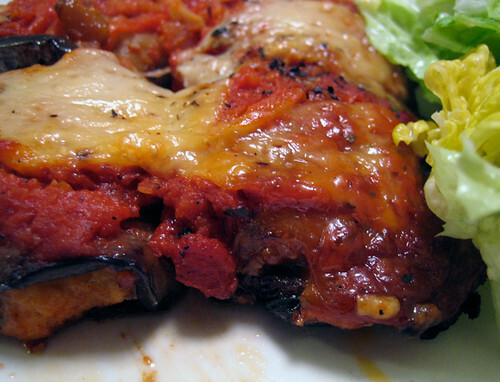 Heat a cast iron griddle pan and brush eggplant slices with olive oil on both sides. Cook eggplant on both sides, getting that lovely criss-cross grill pattern on each side. Repeat until all eggplant slices have been cooked. Set aside. Make your favorite tomato sauce, if making from scratch. Put everything in the fridge and go to bed. 2. In a large bowl, mix together all the stuffing ingredients, ending with the egg. Smell the stuffing….doesn’t that smell amazing? Yes, yes it does. 3. Have a rectangular baking dish ready. 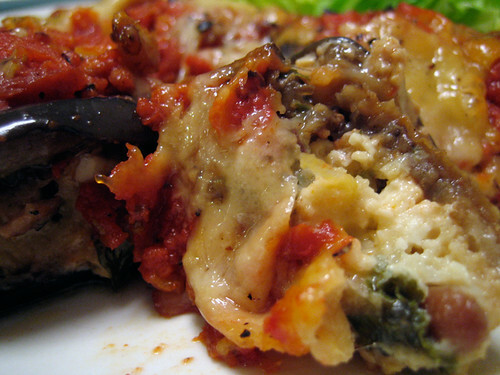 Take out the eggplant slices and place a spoonful of stuffing on a slice and roll up tightly. Place the bundle of eggplant goodness onto the baking dish. Repeat until the baking dish is filled with eggplant roll-ups. I ended up with 19 rolls. Spoon tomato sauce over top and then chop up the mozzarella and place the soft cheese slices on top. Drizzle with really good olive oil, salt and pepper and bake for 25-30 minutes. Out of the oven, let stand for 10 minutes to let things settle before serving. Wow you are an artistic and adventurous cook, I’m impressed! While I love cooking and am learning so much (self taught), I think that my adventurousness is slightly tainted by the fact that I am usually preparing a meal for four small children and do I really want to exert all that energy on something they might not think as delightful as I? Thanks for the inspiration! Great blog! You have converted me into an eggplant lover with this eggplant dish. I love (almost)all things with feta. It looks great! I need to check out that book. Nigella rules…although I have to admit I do not have the Feast book…yet. This looks great and I like eggplant so this will go on the list to try. I’ve always wanted to like eggplant but haven’t found the right recipe to help me. This one looks like it might do the trick. I’m was an eggplant hater, I admit, but there have been a couple of ways I’ve enjoyed it. There used to be a Persian place that would roast it and then whip it smooth and mix it with other tasty things and topp it with perfectly caramelized onions and bake that, heavenly delight that was akin to hummus, but smoother and richer. Also “eggplant caviar”. I finally relinquished my hate when a friend roasted some Japanese/Chinese eggplant, so now that’s about the only kind I’ll eat. Apparently the American kind that has been foisted on me and fueled my hate is more bitter. These look delicious–I love eggplant. I usually call eggplant-rolled-around-cheese ‘rollatini’ instead of involtini… but whatever you call it, I call it good! This recipe looks so great. You did a good job. I always forget about eggplant – using it like this sounds pretty good, though! The only way I’ve disliked eggplant is in caponata (sp?). I love eggplant parmesan, plain fried eggplant, grilled eggplant, Chinese style eggplant with garlic sauce… This might be worth a try. Oh, and Jenni, one of my kids loves egglant parmesan, the other isn’t crazy about it but will eat it. Both will eat plain grilled eggplant though. I love any recipe that asks you to ‘smell the stuffing’. 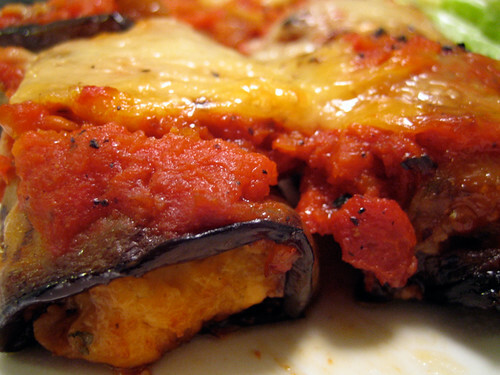 This looks really good … again need new ways to make eggplant. I have to get a cast iron grill pan! I love nigella! thanks jenni for the kind words on my blog! bellini valli, yes, this is the dish to convert all eggplant haters. rachel, it’s a pretty great cookbook! bijoux, i’m not that daring when it comes to eggplant. us vs food, this dish nudged me too! cooper, it’s a great cookbook and this is a truly yummy dish. try it, lynn, you just might like it! mad, i think an asian eggplant is next on my “to try” list! mrs. w, i’ve had a few votes for “rollatini”, whatever, it’s delicious. haha, hag, i had to stick that in there cuz i made cornelius smell it too. it’s that delicious!! vegan blog tracker, i’m sure you could sub in some tofu ricotta and call it vegan delicious! ellen, looks like i’ve got a lot of eggplant cooking to get through! ilovepearly, i’m not there yet, but maybe one day!! not much convincing needed at all, brilynn! How delightful and creative! As usual you have impressed the masses with your wit and excellent cooking. I love eggplant so this one is clearly for me. I am definitely an eggplant fearer, so I will have to save this recipe for when I’m feeling brave and ready to open my heart to eggplant! It looks good. This looks so good! Since I’m an eggplant fan, I’ll have to try this recipe sometime. veggiegirl, this is good! so, so good. trust me, eat_me, try this and see. you’ll love it! i’m almost positive. bellcurves, this is a definite winner! ooh! i’m trying to get my husband to like eggplant lately, so this might be the thing to try. so far, he can handle babaganoush but that’s about it. This is a great recipe. We make it a lot and are always being asked for the recipe by people we’ve served it to. In the latest iteration I’ve been using ricotta instead of feta, which is also very good.